Veterans Carlos Pena, Chad Tracy and Yorvit Torrealba have been released by the Los Angeles Angels after failing to win roster spots during spring training. TEMPE, Ariz. -- After trading Mark Trumbo to Arizona for an infusion of pitching in the offseason, the Los Angeles Angels are hoping to replace some of his 34 home runs with a one-man combination of Julio Franco and Benjamin Button. Third baseman David Freese and reliever Kevin Jepsen have reached arbitration deals with the Los Angeles Angels. 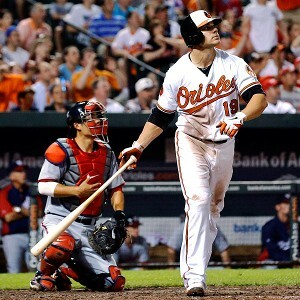 It was 86 degrees in Baltimore on Wednesday night, the ball was flying and we had one of the most exciting games of the season, a 9-6 Orioles victory over the Washington Nationals and one of the hottest pitchers in baseball, including a six-run rally in the seventh inning. Weekend wrap: Here comes Profar! A quick warning about Jurickson Profar's call to the majors to replace the disabled Ian Kinsler: Do not expect Mike Trout; do not expect Bryce Harper; do not expect Manny Machado. The Washington Nationals may be getting third baseman Ryan Zimmerman back from the disabled list soon.Zimmerman is recovering from a balky left hamstring, and the club promoted top prospect Anthony Rendon to cover the hot corner in his stead. Nationals general manager Mike Rizzo says third baseman Ryan Zimmerman had arthroscopic surgery on his right shoulder and is expected to be ready for the start of spring training.